In the shade of my Stupa, the strong wind feels icy cold and forces me to wear the cowl of my sweatshirt. Spiti is baffling that way; you can be melting under the sun and shivering in the shade, simultaneously. 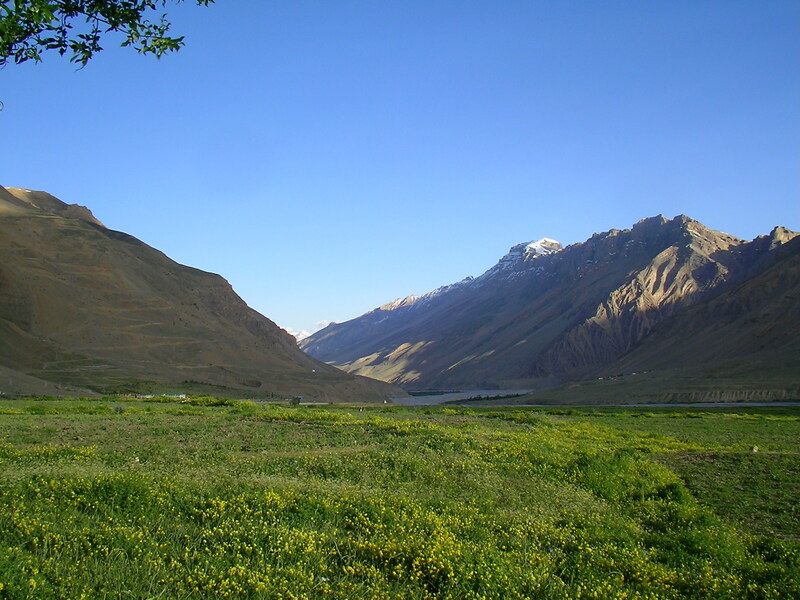 To distract myself from my hot-cold battle, I look towards the only part of Kaza (Spiti’s capital) that is soothingly green. The only crops that can survive the harsh desert climate are barley and peas, and since it’s summer-spring, the shores are filled with green grass and yellow barley, and occasionally interspersed with white, blue, pink and purple flowers. An old lady stops by my spot, carrying an adorable little girl wrapped in a shawl on her back. She curiously asks me where I’m from and what I’m doing away from the market of Kaza, that is always bustling at this hour of the evening. She smiles when I tell her that I love this green isolation, and invites me to walk with her to her little garden. I am surprised; a garden in this cold mountain desert is unfathomable. the garden lady with her grand-daughter. My unsure steps lead me down a slope on a side of the river that’s easy to miss. I pinch myself as I see a row of leafy trees growing tall in Kaza’s dry desert soil. The old lady, amused by my wonder, tells me that the trees don’t bare fruit, that the soil is not that nurturing, and yet she spends the effort to grow them in that small piece of land she calls her garden. The aggressive waters of the Spiti River destroyed the shrubs multiple times, but each year she persevered again. She loves trees, she says, and they’re so rare in this part of the world, she chose to grow her own at the cost of no fruits. Now each evening, she waters them and lets her grand-daughter play in their oxygen-rich shade. She’s spent her whole life in Kaza and seen it transform from half a dozen mud houses to a land of concrete, but the garden remains for her family to cherish, and for the occasional visitor like me. I walk with her from one end to another, as she carefully treads on the soil and ensures that every inch is sufficiently watered. I’ve been smiling to myself in sub-conscious appreciation the entire time. By now, the sun has dipped below the peak, coloring the sky orange. I wave a little goodbye and start to make my way back, past the patch of yellow that reminds me of Sting’s fields of gold. I glance over my shoulder to see my garden lady hard at work with her trees, a sight that I’m carrying with me since, in the brown little town of Kaza. the garden lady hard at work in her garden. Incredible–thanks for sharing. And what a treat for the gardener to share her secret garden with you. Just shows that nature can link and bind us all, if we take the time to stop and wonder together. And then you continued and shared the encounter with all of us. Cool. Great imagery here. It amazing a simple garden can create such a powerful link. How lucky you were to be invited into someone’s passion. I have been to Spiti River. It’s amazing and hope one more visit there if get time and opportunity. Anyway your blog is looking great. Thanks Nature Wonder 🙂 Hope you get the opportunity to visit it again, though I can’t promise it’ll be as pristine as you last saw it. Previous PostTravel Tales From Spiti: The Legend of The Moving Monasteries. Next PostTraveling Alone in India: Am I Crazy?